Why do people love Merino wool t-shirts SOO much (even though the sticker price can make you wince)? The best t-shirts I have. I wore the same shirt everyday for about 20 days while I travelled in Alaska, hiked in the Utah desert and rafted down the Green river. It kept me warm when I was cold, cool when I was hot and really didn’t smell at any point. This is my personal “Go To” T-shirt. I’ve had various different versions of it down through the years. The fact that it is mixed with Nylon makes it a bit more resistant than most merino wool t-shirts. Exists in a wide range of plain colours or graphics. I like the body length considering how tall I personnally am. It is a regular fit, with strangely wide and longer arm sleeves. 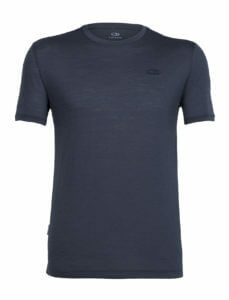 It is one of the few remaining 100% merino wool t-shirts at a very reasonable price which makes it a very popular pick. My wife is an avid minimalist traveller who swears by packing merino wool, so she gave me these three recommendations for women, and you will find the best merino wool tank tops here. What Caro says: A tight fit with a flattering neck line. 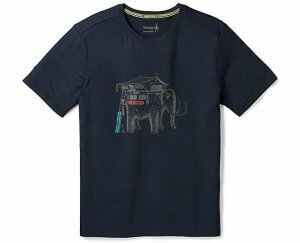 With this t-shirt, you can’t go wrong: it is a recognised brand in merino land known to have high quality clothing. Very lightweight. It exists in many colours. Generally cheaper than Icebreaker, Woolx is an excellent budget alternative. Not much can go wrong with a classic black t-shirt, even if this cut will look more sporty than the Icebreaker one. Merino wool is a very high performance fabric that is really comfortable and smooth to wear. You might be thinking that wool should be itchy, and you’re right for most wools. Merino wool isn’t itchy because the fibers are incredibly fine (as low as 17 microns in some cases). However, the real benefits of merino wool boil down to its antibacterial properties, its natural wicking and insulating properites. What are the Benefits for Hikers & Ultra-minimalist Travellers? 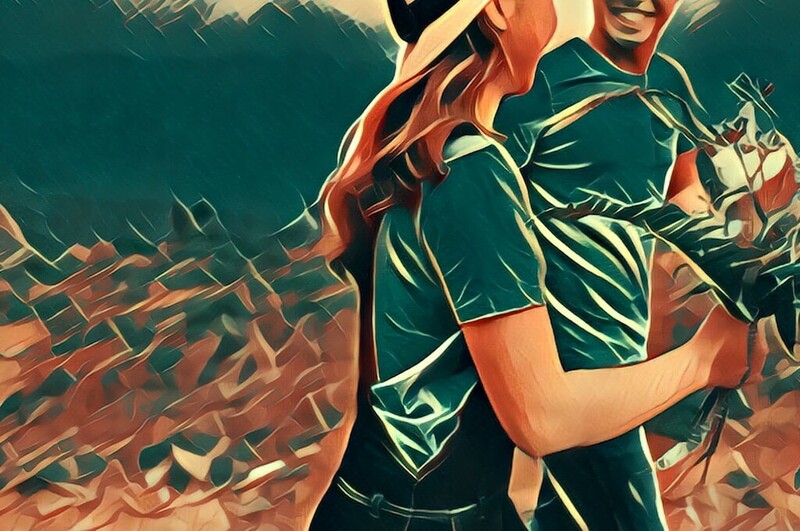 Quality and comfort always speak for themselves, but here are some extremely note-worthy benefits of packing merino wool t-shirts for your adventures in the wilderness. When we go on adventures that take us deep within the wilderness and far away from our comfort zones, the right fabric is all your skin has to protect itself from bacteria, sweat pooling and the harmful rays of the sun. We all hate stinking, don’t we? But when you have to go without a shower for days, it is highly unlikely that you won’t experience foul odours and pools of sweat. However, if you wearing a merino wool t-shirt, you don’t have to worry about the smell. You see, merino wool has a very high-resistance towards bacteria thanks to the lanolin wax in wool, which is antibacterial, allowing you to remain odour-free. So, even if you wear one shirt for a fortnight without washing it or taking a shower, it still won’t smell. Ultra-fine merino wool is full of air pockets that trap air around your body. This insulating effect will keep you warm when it’s cold outside. On the flipside, however, it will also keep you cooler in warmer climates. This “regulating” effect even works when merino is wet. This has spawned the phrase in outdoors communities that “cotton kills”, as you’ll start to loose body heat if your cotton clothes get wet. Merino wool doesn’t allow any kind of moisture to permeate the fabric and make its way towards your skin due to its natural wicking properties that comes from certain fatty acids. Unlike synthetic fibers, merino wool doesn’t repel the water, it absorbs it from the fibers and swells up. Regardless of whether you’re sweating head-to-toe or it’s raining hard on the terrain, merino wool t-shirts will feel dry as they will protect your body against all kinds of moisture, which also allows them to be warm and comfy. Baselayers made out of merino wool are particular effective, because the #1 job of a base layer is to keep you dry. Merino wool is a 100% natural fabric, and unlike most factory-produced fabrics, it is biodegradable, which basically means that it is derived from nature and it returns back to nature. The fit offers good body length with wide arm coverage. 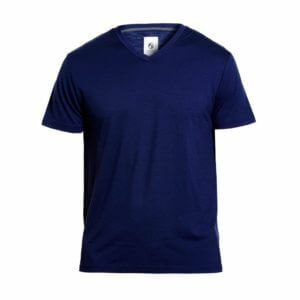 It is one of the few remaining 100% merino wool t-shirts at a very reasonable price which makes it a very popular pick. The fit is very nice. I am fairly tall and I can appreciate the length. However, ideally, you would want the sleeves length to be mid-bicep and lightly hug your arms. As you can see on the picture below, it is not the case for me. I have too much slack around my biceps. On the plus side, it would offer a lot of protection when hiking in the sun. And note that you could always consider having a tailor slim the sleeves to fit your arms better if the rest fits you well. Minus33 is a great option if you’re on a budget, as they are very reasonably priced and is available in different colors. Regarding quality, the fact that it has no tags and flat lock seams means that you can confidently bring it with you on hikes or other sports activities without risking scratching or chaffing. It is one of the rare 100% wool t-shirt that can still be find out there, and being able to enjoy the full potential and benefit of the merino wool is amazing. On the down side, even if it is machine washable, you might want to give it some extra care and simply dry it flat. Remember that 100% merino wool can just literally be hang out in the sun after a few wear and it will be just as effective as washing them. Minus33 is a great option if you’re on a budget, as they are very reasonably priced compared to pricier brands. 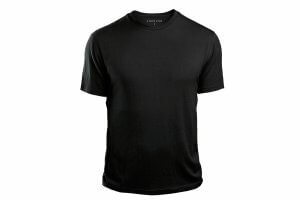 Generally cheaper than other brand, this t-shirt will serve you well in terms of general purpose use of you take it in all black. Nice classic fit with a flattering round neck line. WoolX is a great option if you’re on a budget, as they are very reasonably priced. Regarding quality, the fact that it has flat lock seams means that you can confidently bring it with you on hikes or other sports activities without risking rubbing or chaffing. This is my personal “Go To” T-shirt. I’ve had various different versions of it down through the years. The fact that it is mixed with Nylon means that it is more durable than others. Here’s the ultimate ultra-light merino wool t-shirt to pack for your adventures into the wilderness, mountaineering expeditions and physical demanding activities like rock-climbing. The fabric is very thin, and luxuriously soft, ideal to keep you warm in the cold and sweat-free in the heat. You can shop this design in 10 different colours. A tight fit with a flattering neck line. With this t-shirt, you can’t go wrong: it is a recognised brand in merino land known to have high quality clothing. Very lightweight. It exists in many colours. Best all-around lightweight t-shirt available at the moment. It is versatile enough whether you are travelling or hiking. The fabric is very thin but the blend with the nylon will make it more robust. It is available in many colors and various graphics. Even if the neckline of the Women’s Tech Lite Short Sleeve Crewe is flattering, I wish they made it with their scoop neckline which I find suit me even better for a t-shirt I could wear everyday. That said, I generally use my tank tops more than my t-shirts, which is just a personal preference. Sidenote: the bad reviews reported on Amazon are not related to the quality of the Icebreaker product. These are perfect for wearing in your day-to-day life. 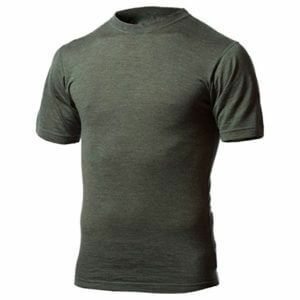 Best looking merino wool t-shirt for men. 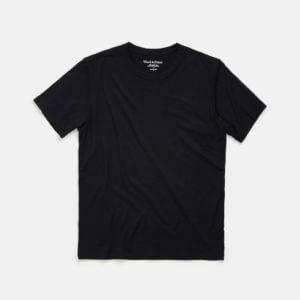 Outlier managed to make a more durable merino t-shirt without blending it with Nylon. They simply use 195gsm fabric rather than the 150-160gsm like most companies. As a result, this t-shirt looks way better than others who can’t get rid of the “sport” look that goes along with them. They are pretty much the best looking ones out there but it comes with a little higher price tag ($110). I just love this brand and have worn their dungarees pants for years. A luxuriously comfy merino wool crew-neck t-shirt that you can pick out for your backpacking trips, sightseeing, and contemporary casual wear, or even for the office. This incredibly soft t-shirt features a versatile design, with quality that is suitable for all kinds of activities and occasions. It’s a little on the heavier side at 210g/sm, so you’ll find it’s good for chillier days. This one is made from 100% merino, so it will feel very luxurious at the expense of durability. A good pick for wearing at the office! 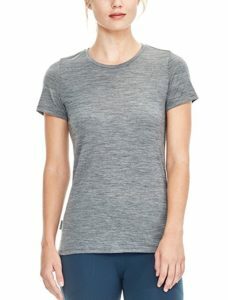 You can also check out their 78/22% merino:nylon blend if you want a more durable t-shirt. This very simple, understated t-shirt comes from Unbound Merino, a small company that sets out to make classic, simple t-shirts. It’s 100% merino wool. They also sell v-necks t-shirts as well. 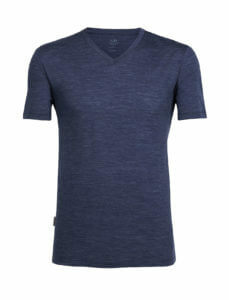 V-neck tees can be nice worn under a shirt in a more formal setting. This one tight fit enough to be worn as a first layer or as a base layer. It’s not entirely merino wool, as it’s a blend. 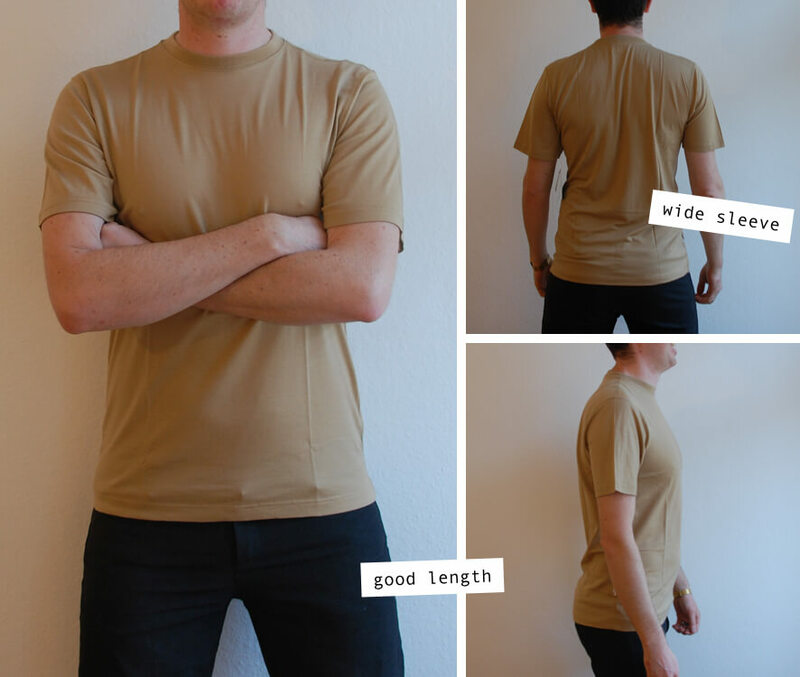 At 130 g/m it’s one of the lighter t-shirts we feature. This v-neck shirt is similar to the our top pick for men, but with a v-neck. Otherwise, the fabric is the same 150 ultralight merino/nylon blend. It’s design for lifestyle, rather than hiking, as it doesn’t come with features such as flatlock seams. These options are better suited for outdoor, sports wear and travelling. Icebreaker also offers their Tech Lite t-shirts with a range of outdoor graphics. Personally I have the bike mobile home one, which is a great conversation starter! Similar to the tech lite t-shirts above, it comes in a light weight 150 g/m2, making it a great option for hiking in summer or layering in winter. SmartWool is one of the older merino wool brands. 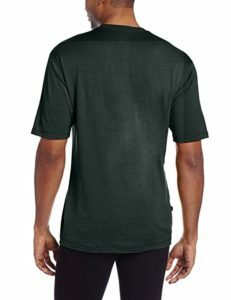 They have a range of ultra-light 150g/m2 t-shirts with features such as off-set seams designed to work well for hikers. It’s a blend of merino wool and nylon designed to give more durability. And I think the graphic is super cool! If you’re undertaking a physically demanding adventure, be it rock climbing, mountaineering or cycling, you require the comfort and durability of a versatile fabric that can weather the pressure, the wear and tear and uncertainty of the wilderness. 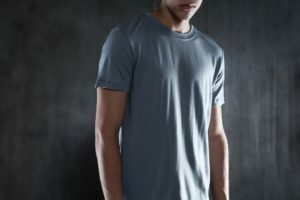 This round merino wool t-shirt features a short-sleeved design, and the innovative Core Spun technology, which enhances its durability y wrapping it in a nylon core. It also features smooth flat lock seams that prevent the annoying incidents of chafing and offset shoulders. Its touch is feathery soft, and it is ideal to allow your skin to breathe while the heat and humidity pours down on your head. 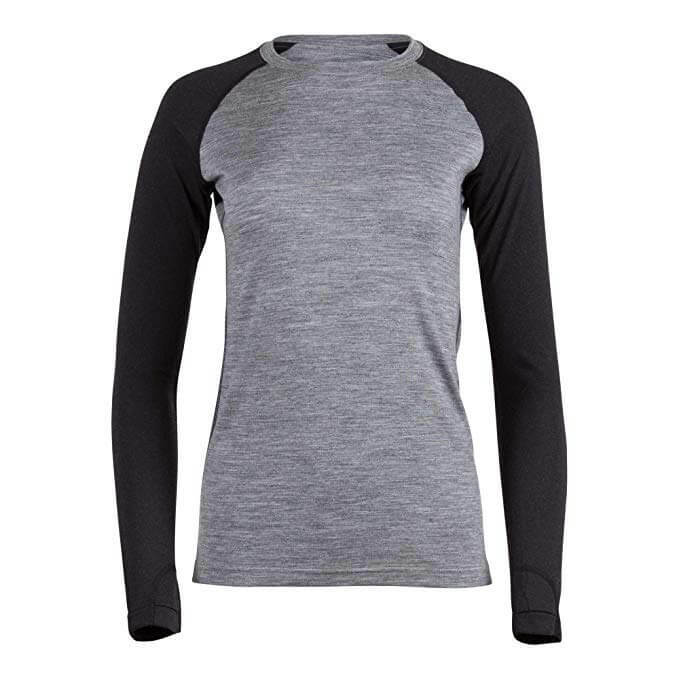 This long-sleeved t-shirt from Minus33 is a great choice for outdoors and hiking. A little heavier than typical t-shirts, it will work great by itself in the summer in chillier morning conditions or as a baselayer in winter. Minus33 products tend to come with more technical features such as flatlock seams, tagless construction and regular fit. Minus33 also offer a 230g/m2 version called Chocourua, which can be worn a pull-over in moderate conditions. This is a long-sleeved version of the tech t-shirt recommended above. A few difference such as 100% merino wool and 200 g/m fabric along with offset seams and flatlock construction make this a simple classic. You’ll also find tech lite versions at 150 g/m2 with 87% merino wool and 13% nylon. The Oasis range that we cover in the base layer article are even more technical garment for hiking, skiing or outdoor work. This is my go-to top for anything sport or relax activities related these days. It offers good coverage on the body and sleeves length as well as around the neck. 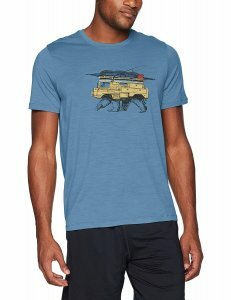 This is the new version replacing their popular 100% merino Inversion modal. Even if the Aspect is made of 16% Nylon construction, it has never smelled (I have tried really hard!). Very soft, I have been pretty much wearing it all Winter around the house. This relaxed fit top has been the perfect top to keep me warm in the cold gym where I train, as well as through the days I got the flu with a body temperature rising up and down. The round crew neck offers good coverage to keep you warm. It exists in black as well as other plain colors. Beware that the black might catch some dust. The material feels very durable compared to other merino I have. 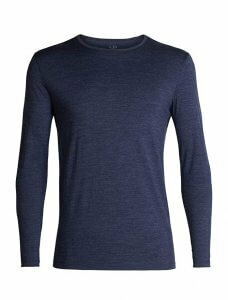 It is been designed as a base layer, rather to be worn on it’s own as it is a very thin 100% merino wool top. But I love the boat neck line so much that I have found myself wearing it as a outwear, with a small black cami under it with jeans. I have bought my first Oasis Long Sleeve Scoop t-shirt back in 2015 and it has been one of my preferred basic ever since. In terms of durability, I am currently wearing my 3rd one. It gets a whole after one year of heavy wearing which I think is okay for a classic I wear all the time. It is thin top that will keep you warm in the Winter. The scoop neck as well as the slim fit makes it easier to wear under another top compared to a crew neck or regular fit t-shirt. The cut is so flattering, even though it does get a bit looser after a few days of wear, that you wouldn’t know that it is a thermal clothing. It is just looks like a normal top. Thanks so much for making this website! Is great!